If you love playing such racing categorized game in the middle of your spare time, Dr. Driving APK 1.48 could be a recommended one to try. Different to other racing games that require you to rely on high speed, Dr. Driving offers more relaxing driving experiences. Therefore, it could be a really suitable game that recommended for you to pleasure your spare time through playing such interesting game. Playing this game will let you drive any ordinary car with urban background generally and of course in the middle driving speed. However, even if you are driving your car in the middle driving speed, it does not mean that you will not get the challenging experiences at all. There are several unique and challenging missions that should be completed during playing the game. The missions could be such driving task from certain place to another without hitting any available objects on the road. 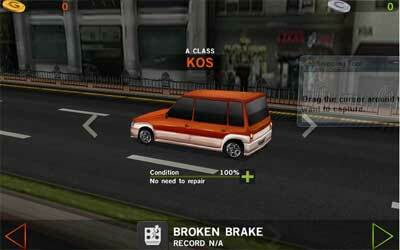 Another challenging mission is a task how you could park your car properly in any certain circumstances. If you are successfully driving in the right manner and performance then it means that you already completed the mission. When you get the mission completed, you would be rewarded to get such amount of money that could be used for buying the new better car. Since this game requires you to drive a car with full of responsibility to complete the mission, it could be also a good recommended driving game for kids. No wonder that parents widely choose this game to educate their teenage kids how to drive safely without inconsiderate. As additional information, you are able to download this relaxing racing game through Google Play for any devices powered by Android. Just make sure that your smartphone already uses at least the Android 2.3.3 version to play Dr. Driving for android smoothly.